It's official...we are having a baby boy. Mia asked to see baby brotha as soon as we started the ultrasound. 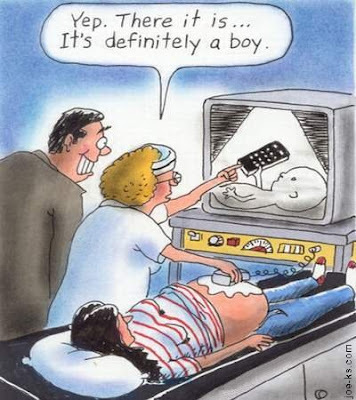 It took the tech about 2 seconds to confirm the baby's boyhood. He moved a LOT. The poor tech was having trouble pinning the little guy down for measurements. I also had several contractions which delayed the ultrasound so she could see where my placenta is. Good news is that the placenta moved about halfway off the cervix, so should not be a problem later on. Bad news is that I keep having contractions especially if I try to walk or exercise. Dang it!!! Now all we have to do is decide on a name...we both like.